The joint report by the Institute for Manufacturing (IfM) and the United Nations Industrial Development Organization (UNIDO), Emerging Trends in Global Advanced Manufacturing: Challenges, Opportunities and Policy Responses, analyses the megatrends shaping the future of manufacturing. The interim report will be presented today at the Global Manufacturing and Industrialisation Summit in Abu Dhabi. The report also examines how world-leading manufacturing countries are implementing their new national industrial innovation policies in the global race to grow competitive manufacturing industries. Head of IfM’s Policy Links unit and report co-author, Dr Carlos López-Gómez, says the report provides an international context to inform policies and support manufacturing innovation and economic growth: “The boundaries of manufacturing as an economic activity are increasingly blurry and advanced manufacturing is, in fact, inherently multidisciplinary. Modern manufacturing involves activities across a range of industries, technologies and components. “As a result, policy-makers need to look beyond traditional industrial sectors to get a full understanding of the challenges and opportunities facing advanced manufacturers. Software and services are being integrated into products, but embedded software and the ‘app economy’ can simply not be measured with available economic data. “Statistical analyses based on the same traditional sectoral and technological boundaries are not going to give an accurate picture of modern manufacturing. New approaches are necessary to more accurately represent the way in which modern manufacturing activities are organised. The report also identifies that effective policies require a systemic understanding of innovation. Dr Eoin O’Sullivan, Director of the Centre for Science, Technology & Innovation Policy (CSTI), also contributed to the report. He emphasises that: “It is increasingly recognised that R&D funding, while a basic component in an innovation policy portfolio, is in itself not sufficient to achieve industrial competitiveness and economic growth. “Policies are also required to support the scale-up of emerging technologies, commercialisation of those technologies by business, adoption of technology by small and medium-sized enterprises and the development of new advanced manufacturing skills.” Dr O’Sullivan argues that interpreting advanced manufacturing as a cross-cutting policy themes can help bring technology, sector and innovation policies together. 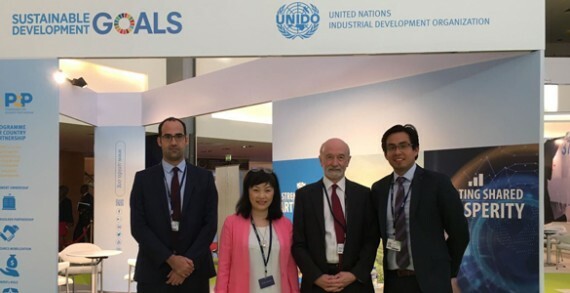 The report is part of the ongoing collaboration between UNIDO and the Institute for Manufacturing at the University of Cambridge.